Matthew Clark was in attendence at the con this year. I had a commission from Matthew at a New York con from months ago; Luckily, he remembered! 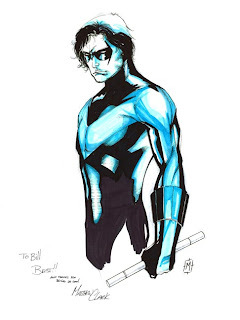 I've been loving his rendition of Nightwing in OUTSIDERS, so I had him draw that character. Matt said it took him awhile to figure out how to approach Nightwing, but he feels comfortable drawing him now. I'll just say that this piece is one of my favorites of the NYCC! Hey, if TEEN TITANS ever needs a new art team, I vote for the Matthew Clark/Art Thibert combo.